For other uses, see Kit Kat (disambiguation). "Have a break...Have a Kit Kat!" "Gimme a break, Gimme a break, Break me off a piece of that Kit Kat Bar! ", "Break time, anytime"
Kit Kat is a chocolate-covered wafer bar confection created by Rowntree's of York, United Kingdom, and is now produced globally by Nestlé, which acquired Rowntree in 1988, and closed it in 2006, with the exception of the United States where it is made under license by H.B. Reese Candy Company, a division of The Hershey Company. The standard bars consist of two or four pieces composed of three layers of wafer, separated and covered by an outer layer of chocolate. Each finger can be snapped from the bar separately. There are many different flavours of Kit Kat, including milk, white, and dark chocolate. Use of the name Kit Kat or Kit Cat for a type of food goes back to the 18th century, when mutton pies known as a Kit-Kat were served at meetings of the political Kit-Cat Club in London owned by pastry chef Christopher Catling. The origins of what is now known as the Kit Kat brand go back to 1911, when Rowntree's, a confectionery company based in York in the United Kingdom, trademarked the terms Kit Cat and Kit Kat. The names were not used immediately and Kit Kat first appeared in the 1920s, when Rowntree's launched a brand of boxed chocolates entitled Kit Cat. This continued into the 1930s, when Rowntree's shifted focus and production onto its Black Magic and Dairy Box brands. With the promotion of alternative products the Kit Cat brand decreased and was eventually discontinued. The original four-finger bar was developed after a worker at Rowntree's York Factory put a suggestion in a recommendation box for a snack that "a man could take to work in his pack". The bar launched on 29 August 1935, under the title of Rowntree's Chocolate Crisp (priced at 2d), and was sold in London and throughout southern England. Rowntree's Chocolate Crisp was renamed Kit Kat Chocolate Crisp in 1937, the same year that Kit Kat began to incorporate "Break" into its recognisable advertising strategy. [definition needed] The colour scheme and first flavour variation to the brand came in 1942, owing to World War II, when food shortages prompted an alteration in the recipe. The flavour of Kit Kat was changed to dark chocolate; the packaging abandoned its Chocolate Crisp title, and was coloured blue. After the war the name became Kit Kat, with the original milk chocolate recipe and red packaging. Following its success in the United Kingdom, in the 1940s Kit Kat was exported to Canada, South Africa, Ireland, Australia, and New Zealand. In 1958, Donald Gilles, the executive at JWT Orland, created the iconic advertising line "Have a Break, Have a Kit Kat". The brand further expanded in the 1970s when Rowntree created a new distribution factory in Germany to meet European demand, and established agreements to distribute the brand in the US through the Hershey company, and in Japan through Fujiya. In June 1988, Swiss company Nestlé acquired Kit Kat through the purchase of Rowntree's, giving Nestlé global control over the brand, except in the US, and production and distribution increased with new facilities in Japan and additional manufacturing operations set up in Malaysia, India and China. The Hershey Company has a licence to produce Kit Kat bars in the United States which dates from 1970, when Hershey executed a licensing agreement with Rowntree which allowed Hershey to retain the Kit Kat licence so long as Hershey was not sold. Nestlé, which has a substantial presence in the US, had to honour the licensing agreement when it bought Rowntree in 1988. As Kit Kat is one of Hershey's top five brands in the US market, the Kit Kat licence was a key factor in Hershey's failed attempt to attract a serious buyer in 2002. Variants in the traditional chocolate bar first appeared in 1996 when Kit Kat Orange, the first flavour variant, was introduced in the United Kingdom. Its success was followed by several varieties including mint and caramel, and in 1999 Kit Kat Chunky was launched and received favourably by international consumers. Variations on the traditional Kit Kat have continued to be developed since then. In 2000 Nestlé acquired Fujiya's share of the brand in Japan, and also expanded its marketplace in Japan, Russia, Turkey, and Venezuela, in addition to markets in Eastern and Central Europe. Throughout the decade Kit Kat introduced dozens of flavours and line extensions within specific consumer markets. It celebrated its 75th anniversary on 10 October 2009. The traditional bar has four fingers which each measure approximately 1 centimetre (0.4 in) by 9 centimetres (3.5 in). A two-finger bar was launched in the 1930s, and has remained the company's best-selling biscuit brand ever since. The 1999 Kit Kat Chunky (known as Big Kat and Kit Kat Extra Crispy in the US) has one large finger approximately 2.5 centimetres (1 in) wide. Kit Kat bars contain varying numbers of fingers depending on the market, ranging from the half-finger sized Kit Kat Petit in Japan, to the three-fingered variants in Arabia, and the twelve-finger family-size bars in Australia and France. Kit Kat bars are sold individually and in bags, boxes and multi-packs. In Ireland, France, the UK and America Nestlé also produces a Kit Kat ice cream, and in Australia and Malaysia, Kit Kat Drumsticks. In 2010, a new £5 million manufacturing line was opened by Nestlé in York, to produce more than a billion Kit Kat bars each year. Countries where Kit Kat is marketed. Kit Kat bars are produced in 16 countries by Nestlé: Brazil, Mexico, United Kingdom, Canada, Australia, New Zealand, South Africa, Germany, Russia, Japan, China, Malaysia, Thailand, India, Turkey, United Arab Emirates, Bulgaria and Algeria. Kit Kat bars in the United States are produced under licence by The Hershey Company, a Nestlé competitor, due to a prior licensing agreement with Rowntree. The year 2003 was a turning point for the Kit Kat bar as well as the confectionery industry in general. The popularity of low carb diets, and the push to healthier eating stifled sales growth in many parts of the world. In addition, fierce competition from Cadbury's newly formed Dairy Milk superbrand also contributed to Kit Kat sales decreasing considerably in its home market of the UK, and threatened to depose it from its No.1 position. The solution adopted by Nestlé and others was to increase dramatically the number of new and unique variations of their confections and market them as limited or special editions, usually only available for a few months at a time so as not lose sales of their standard products. The strategy initially reversed the decline of the Kit Kat and has been adopted worldwide by Nestlé, Hershey, Mars, and others with similar success. This has resulted in many new flavours and varieties of the Kit Kat and other confections appearing globally since then. While some flavours succeeded, many failed, alienating some consumers in the process, causing Nestlé to scale back on new releases. In September 2006, Nestlé announced that they would be cutting 645 jobs in their York factory and moving all Smarties production to their Hamburg factory, which had already been producing two-thirds. They stated that this move would allow for a £20 million investment to modernise the antiquated York factory and improve Kit Kat production. As dark chocolate has seen increased demand and favour worldwide because of its purported health benefits, in September 2006 the four-finger Kit Kat Fine Dark was launched in the United Kingdom as a permanent product, and packaging for the entire brand was changed. Hershey had sold the four-finger Kit Kat Dark in the US several years previously as a limited edition, and began doing so again. Nestlé now manufactures two-finger Kit Kats with natural flavourings, and for the first time, Kit Kats in this format are suitable for vegans. It is not known at this date whether or not other varieties will follow suit. In 2014, Kit Kat was ranked the third best selling chocolate bar in the United Kingdom, after Dairy Milk and Galaxy. When first introduced, the original Rowntree's Chocolate Crisp bar had a red wrapper, which briefly became blue between 1945–1947. As a result of milk shortages after the end of World War II, dark chocolate was used instead of milk chocolate during that period. Since its introduction in the 1970s, the Hershey's Kit Kat packaging and advertising in the United States differed from the branding used in every other country where it was sold. In 2002, Hershey Kit Kats adopted the slanted ellipse logo used worldwide by Nestlé, though the ellipse was red and the text white. The US version of "Kit Kat Chunky" is known as "Big Kat". In the United Kingdom, the product was traditionally wrapped in silver foil and an outer paper band. In 2001 this was changed to flow wrap plastic. Foil and paper wrapping is still used for Kit-Kats sold as part of a multipack. After launching in the 1930s, Rowntree's Chocolate Crisp was originally advertised as "the biggest little meal" and "the best companion to a cup of tea". During World War II, Kit Kat was depicted as a valuable wartime foodstuff, with the slogan "what active people need". 'Kitty the Kat' arrived in the late 1940s to emphasise the "rich full cream milk" qualities of the bar and, thanks to contemporary improvements in production methods, also highlighted the new and improved 'snap' by responding to a biscuit being broken off screen. The first Kit Kat poster appeared in 1951, and the first colour TV advertisement appeared in 1969. Since 1958, the slogan for the Kit Kat in the UK and elsewhere has been "Have a break... have a Kit Kat". However, in 1995, Nestlé sought to trademark the "Have a break" portion. After a ten-year legal battle, which was contested by rival Mars, the European Court of Justice ruled on 7 July 2005 to send the case back to the British courts. In 2004, Nestlé UK used the slogan "Make the most of your break", but later returned to the original slogan. The United States also used the short-lived slogan, "Tastes So Good, You'll Roar", in the early 1980s. The TV commercial most known from this slogan involves a young man biting into one of the Kit Kat bars in a grocery store, and roaring like a lion so loudly the whole store shakes violently, knocking items from the shelves. Another short-lived US slogan was "That's What You Want", whose television adverts showed people pulling unlikely foodstuffs from their pockets or purses, before rejecting them in favour of a Kit Kat. The "classic" American version of the "Gimme a Break" Kit Kat jingle (in use in the US since 1986) was written by Ken Shuldman (copy) and Michael A. Levine (music) for the DDB Advertising Agency. Versions of the original have been covered by Carrie Underwood, Shawn Colvin, and many studio singers, as well as people who have appeared on-camera in the commercials. The jingle was cited in a study by University of Cincinnati researcher James J. Kellaris as one of the top ten "earworms" – bits of melody that become stuck in your head. Another version of the advertising jingle 'Gimme a break' created for Kit Kat "Factory" commercial in the US was an original recording by Andrew W.K. W.K. was hired to write a new musical version for their "Gimme a break" slogan. Variations on the Andrew W.K. advertisement included executive dance routines in corporate offices and a network newsroom. However, the "classic" song has also been used again since the newer version first aired in 2004. Many adverts were worldwide hits among them in 1980's with Ken Campbell in a advert with Heaven and Hell with Devil and Angel on Television. A 1989 United Kingdom advertisement for Kit Kat, in which a zoo photographer "takes a break" from waiting for pandas to appear in an enclosure and misses them performing a dance routine, came in 30th in Channel 4's "100 Greatest Adverts" poll in 2000. The Maltese tour boat MV Lady Davinia had a distinctive red and white Kit Kat paint scheme before she sank in 2008. In late 2004 through to the end of 2006, Nestlé Rowntree sponsored the English football club York City F.C.. As a result, the club's home-ground, Bootham Crescent, was renamed to KitKat Crescent. In a 2012 advertising campaign in the UK and Ireland, several new flavours of Chunky Kit Kat were marketed, with consumers being asked to vote for their favourite. Selecting from white chocolate, double chocolate, peanut butter, and orange, Peanut butter was the winner by having 47% of votes. A similar campaign occurred in 2013 with mint, coconut, hazelnut and chocolate fudge. In September 2013, it was announced that version 4.4 of Google's Android mobile operating system would be named "KitKat". Google licensed the name from Nestlé, with no money changing hands. A promotion ran in numerous countries with specially branded Android Kit Kat bars to win Nexus 7 devices and Google Play Store credit. In December 2009, it was announced that the four-finger variety of Kit Kat would use Fairtrade chocolate (at least in Britain and Ireland) from January 2010. The Fairtrade Kit Kat promotion was extended to the finger edition in January 2010. During the first three weeks of Big Brother Series 7, Channel 4 conducted a promotion in conjunction with Nestlé to distribute 100 "golden tickets" randomly throughout Kit Kats, in a style reminiscent of the story Charlie and the Chocolate Factory. Members of the public finding these tickets were permitted to use them to give themselves a chance to become a Big Brother housemate and bypass the standard auditions process. Golden ticket holders were invited to a television show where one of them, Susie Verrico, was chosen to enter the House by Aisleyne Horgan-Wallace, picking a ball out of a machine at random. This contest caused some controversy, with the Advertising Standards Authority saying that the terms and conditions of the draw should have been made clearer in related advertisements, and that an independent adjudicator should have been present before and during the draw. Many varieties of Kit Kat have existed, either permanently or as limited editions, such as those sold to commemorate festivals such as St. Valentine's Day. In Japan, Nestlé has introduced over 200 different flavours since 2000, including ginger ale, soy sauce, creme brulee, green tea, sake, and banana. The flavours are designed to appeal to younger buyers, and are often bought as good-luck gifts as the brand name echoes the Japanese phrase "Kitto Katsu", roughly translating as "surely win." The Kit Kat Orange was the first flavour variant to be introduced in the United Kingdom, in 1996 and 1998 in Ireland. It was followed in 1997 by the Kit Kat Dark and Kit Kat Mint. All three were available as permanent editions of the two-finger multipack in the United Kingdom, along with the Kit Kat Original, the Kit Kat White, and from 2012 the Kit Kat Cookies & Cream. A wide variety of promotional items exist, ranging from traditional merchandise (such as mugs, pens, oven gloves and tea-towels) to less common items such as coats for small dogs. Recently in Japan,[when?] Kit Kats have come packaged with CD singles, and a special limited edition double pack of Kit Kat Crispy Monogatari came bundled with a mini book featuring six short stories, one of which was written by Koji Suzuki, author of the Ring cycle series. In Japan, Kit Kats are also available in jars that are dispensed from vending machines. The 'standard' Kit Kat finger bars can come in a variety of presentations and nutritional values. The bars can come in a miniature form of two finger mini bars, or a larger standard four, or in some cases, three, fingered bars. The standard size has been upgraded in several cases up to a 'monster Size' bar, which can include up to five or eight fingers. Large single-fingered "Chunky Kit Kats" were launched in the United Kingdom in 1998 and have been sold in a variety of flavours. The market for Chunky Kit Kats has also expanded to Canada. Other forms and shapes include "Choc'n'Go" individually wrapped fingers in France, a twelve-finger "Family Block" available in New Zealand and Australia, round bite-sized "Pop Choc" pieces, square "Kubes", praline-filled "Senses", a yoghurt with Kit Kat pieces, and a Kit Kat ice cream cone. In the 1980s, a Kit Kat with five shorter fingers was sold in vending machines in the UK. The Japanese Bake 'N Tasty Mini Kit Kats Custard Pudding Flavour was launched in 2014. The bar must be baked in an oven before consumption, and the surface sugar caramelises in the process. In 2015, a new luxury and giftable variant of Kit Kat called Kit Kat Rubies was launched in Malaysia. Comes with the box of 20 small bars, the Kit Kat Rubies bar made with the premium chocolate truffle cream and imported roasted hazelnut pieces. 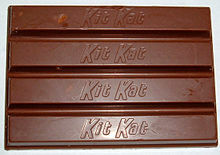 As of 2017, U.S. variants include the standard and king-size four-finger bars, standard bars covered with white or dark chocolate, snack-size orange-covered bars for Halloween, bagged wrapped one-finger miniatures (original and assorted), unwrapped minis, a redesigned Big Kat, and a king-size Big Kat (two of the new Big Kat bars). Kit Kat has opened a Chocolatory in the Melbourne Central Shopping Centre in Melbourne, Australia. The shop allows customers to use touch screens to create their own Kit Kat from a selection of chocolates and ingredients; they are made while the customers wait. In March 2010, Kit Kat was targeted for a boycott by Greenpeace for using palm oil, which the environmental organisation claimed resulted in destruction of forest habitats for orangutans in Indonesia. A YouTube video by Greenpeace went viral and Nestlé announced a partnership with The Forest Trust to establish "responsible sourcing guidelines" and ensure that its products did not have a deforestation footprint. They aimed to achieve a fully sustainable method of palm oil harvesting by 2015. Nestlé state that 58% of palm oil purchased in 2017 was responsibly sourced. Kit Kat Milk Chocolate is made for the North American market with the ingredient PGPR (polyglycerol polyricinoleate, E476, AKA Palsgaard PGPR 4150), which is used to reduce the amount of cocoa butter needed and as an emulsifier. The FDA has determined it to be safe for humans in amounts up to 7.5 milligrams per kilogram of body weight. "Liver and kidney enlargement was noticed at much higher doses." Original Kit Kat ingredients unless otherwise stated, listed by decreasing weight: milk chocolate (sugar, milk ingredients, cocoa butter, cocoa mass, whey powder, lactose, soya lecithin, polyglycerol polyricinoleate, natural flavour), wheat flour, sugar, modified palm oil, cocoa, sodium bicarbonate, soya lecithin, yeast, and natural flavour. Milk chocolate (66%) (sugar, cocoa butter, cocoa mass, dried whole milk, cocoa mass, lactose and proteins from whey, whey powder, emulsifier (sunflower lecithin), butterfat, flavouring), wheat flour, sugar, vegetable fat, cocoa mass, yeast, raising agent (sodium bicarbonate), salt, emulsifier (soya lecithin), flavourings. In 2006, the UK four-finger Kit Kat contained 233 dietary calories (kcal) (975 kilojoules). In 2009, the two-finger Kit Kat contained 107 calories. In 2013, the UK Kit Kat Chunky contained 247 calories which reduced to 207 calories in 2015. This correlated to a reduction in weight by 19% from 48 g to 40 g.
Hershey's Kit Kat Crisp Wafers in Chocolate contain sugar, wheat flour, cocoa butter, nonfat milk, chocolate, refined palm kernel oil, lactose (milk), milk fat, contains 2% or less of: soy lecithin, PGPR (emulsifier), yeast, artificial flavor, salt, and sodium bicarbonate. Milk chocolate (sugar, modified milk ingredients, cocoa butter, cocoa mass, whey powder, lactose, soya lecithin, polyglycerol polyricinoleate, natural flavour), wheat flour, sugar, modified palm oil, cocoa, sodium bicarbonate, soya lecithin, yeast, Natural Flavour. Dark chocolate (sugar, unsweetened chocolate, cocoa butter, milk ingredients, soya lecithin, salt, artificial flavour), wheat flour, sugar, modified palm oil, unsweetened chocolate or cocoa powder, sodium bicarbonate, soya lecithin, artificial flavour. May contain salt and/or yeast. In Japan, Kit Kats are produced at Nestlé-owned factories in Himeji and Kasumigaura. The milk chocolate used for Kit Kats is made from whole-milk powder and Nestlé buys most of its cacao beans from West Africa. Nestlé has factories in various locations in China, to supply to China and Hong Kong. During the 2008 Chinese milk scandal, where melamine was found to have tainted some milk suppliers in China, importers in Hong Kong chose to import bars manufactured in the United Kingdom. ^ "Nestlé UK Website- History of Rowntree". Archived from the original on 18 March 2007. Retrieved 4 April 2007. 1988 – Nestlé SA buys Rowntree plc. ^ "The Origin of the name Kit Kat". Nestlé. ^ Smith, Andrew (31 January 2013). The Oxford Encyclopedia of Food and Drink in America. OUP. ISBN 9780199734962. ^ a b c d e "Happy 75th birthday Kit Kat". Nestlé. Archived from the original on 15 October 2010. Retrieved 10 October 2010. ^ "KitKat's 75th anniversary heralded". The Press. Christchurch, New Zealand: Fairfax Media. 12 October 2010. Retrieved 4 May 2013. ^ a b "The History of Kit Kat". Nestlé. Retrieved 4 May 2013. ^ "Kit Kat Turns 75". Stevenage, England: Popsop. 11 October 2010. Archived from the original on 20 June 2013. Retrieved 4 May 2013. ^ "Kit Kat Celebrates its 75th Anniversary". Net News Publisher. 12 October 2010. Archived from the original on 20 January 2013. Retrieved 4 May 2013. ^ "Nestlé quiet on Hershey sale". Confectionery News. William Reed Business Media. 5 August 2002. Retrieved 5 May 2013. ^ Sorkin, Andrew Ross (27 August 2002). "Possible buyers, seller far apart on Hershey sale / Price and politics are obstacles". San Francisco Chronicle. San Francisco: Hearst Communications. New York Times. Retrieved 4 May 2013. ^ "Nestlé's new UK wafer line to boost Kit Kat production". Nestlé. 20 December 2010. Retrieved 4 May 2013. ^ "Fat profits: Choc tactics". BBC News. 24 March 2004. Retrieved 4 May 2013. ^ "Consumers 'snub unhealthy brands'". BBC News. London: British Broadcasting Corporation. 13 December 2003. Retrieved 4 May 2013. ^ Uhlig, Robert (19 February 2004). "Cheesecake Kit Kat? Give us a break". The Telegraph. London: Telegraph Group. Retrieved 4 May 2013. ^ "Limited Editions Are Latest Candy Craze". ABC News. 18 July 2005. Retrieved 4 May 2013. ^ "645 jobs lost as Nestlé ships Smarties abroad". The Guardian. 21 September 2006. Retrieved 14 July 2017. ^ "Hersheys Product Locator". The Hershey Company. Archived from the original on 25 November 2010. Retrieved 6 December 2010. ^ "Kit Kat slogan dispute sent back to U.K. courts". International Herald Tribune. La Défense, France: The New York Times Company. 8 July 2005. Retrieved 5 May 2013. ^ Marinovich, Slaven (6 June 2005). "Kit Kat barred". Brand Channel. Interbrand. Archived from the original on 3 December 2013. Retrieved 5 May 2013. ^ "City stadium takes sponsor's name". BBC News. London: British Broadcasting Corporation. 18 October 2005. Retrieved 5 May 2013. ^ Kelion, Leo (3 September 2013). "Android KitKat unveiled in Google surprise move". BBC News Online. Retrieved 4 September 2013. 'This is not a money-changing-hands kind of deal,' John Lagerling, director of Android global partnerships, told the BBC. ^ "Google: Next Android mobile software version dubbed 'KitKat'". Business Line. Chennai. Press Trust of India. 4 September 2013. Retrieved 4 February 2019. ^ Wallop, Harry (7 December 2009). "Nestlé's Kit Kat goes Fairtrade". The Telegraph. London: Telegraph Group. Retrieved 5 May 2013. ^ Chambers, Andrew (12 December 2009). "Not so fair trade". The Guardian. London: Guardian News & Media. Retrieved 5 May 2013. ^ "Big Brother contest slammed again". Archived from the original on 29 September 2007. Retrieved 11 October 2006. ^ a b Ivine, Dean (2 February 2013). "How did Kit Kat become king of candy in Japan?". cnn.com. Cable News Network. Archived from the original on 8 February 2016. Retrieved 5 May 2013. ^ Chappell, Bill (10 May 2010). "Kit Kat Kaleidoscope: Far-Out Flavours From Japan". npr.com. Washington, D.C.: NPR. Retrieved 5 May 2013. ^ Ryall, Julian (2 February 2005). "Exam fever gives Japan a craving for Kit Kat". The Telegraph. London: Telegraph Group. Retrieved 5 May 2013. ^ "KIT KAT". Nestlé New Zealand. Retrieved 15 November 2018. ^ "Ben Viveur: Tuck Off". Ben Viveur. 21 June 2014. Retrieved 25 June 2014. ^ Lam, Charles. "Kit Kats You Can Bake Coming to.. Japan". ocweekly.com. Archived from the original on 15 March 2014. Retrieved 15 March 2014. ^ Tey, Kelly (3 January 2015). "Rolling out delicious 'rubies'". thestar.com.my. Retrieved 5 March 2015. ^ "Kit Kat Products". Hershey.com. Retrieved 27 January 2017. ^ Poynton, Scott (18 March 2011). "Dancing With Devils". The Huffington Post. New York: AOL. Retrieved 5 May 2013. ^ Armstrong, Paul (2 March 2013). "Greenpeace, Nestlé in battle over Kit Kat viral". cnn.com. Cable News Network. Retrieved 5 May 2013. ^ "Nestlé committed to traceable sustainable palm oil to ensure no-deforestation". Nestlé. 30 October 2012. Retrieved 5 May 2013. ^ "Palm oil". Nestlé. 2018. Retrieved 11 November 2018. ^ "KIT KAT Milk Chocolate". Archived from the original on 17 February 2015. Retrieved 22 January 2015. ^ "Manufacturers overlook cocoa butter savings" (PDF). ^ "GRAS Notice 000466: polyricinoleic acid" (PDF). Retrieved 9 July 2016. ^ "KIT KAT Collection". Nestlé. Retrieved 5 May 2013. ^ "A low calorie treat from KitKat". Easier. 16 January 2008. Retrieved 5 May 2013. Wikimedia Commons has media related to Kit Kat. This page was last edited on 8 April 2019, at 21:24 (UTC).